Windows 8 Task Manager does not have much changes in the task manager except the dialog box. 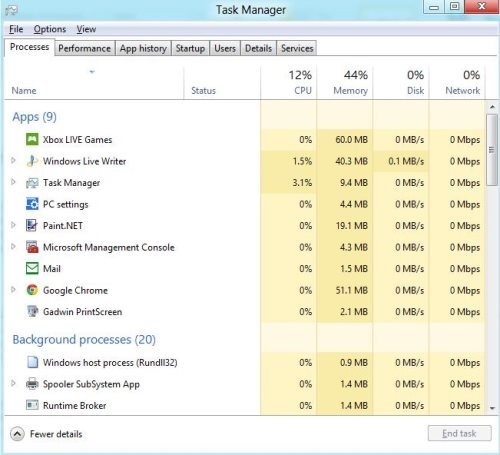 Windows 8 task manager is certainly more specified as all the processes are divided into different categories. These categories reduces the significant time that user spend threading with different apps. This task manager is bit amazing with all new aspect of Windows 8. Still we except something more blooming from Windows 8 task manager like a great quote, Unlimited wants with limited resources. 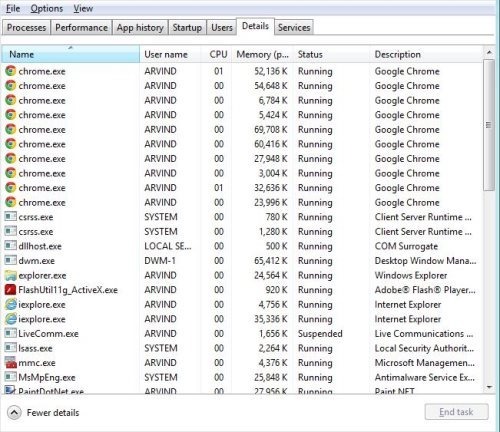 Normally, when you access Windows 8 task manager, its shows the apps which are currently processing on your PC. Processes tab shows only CPU and Memory usage. 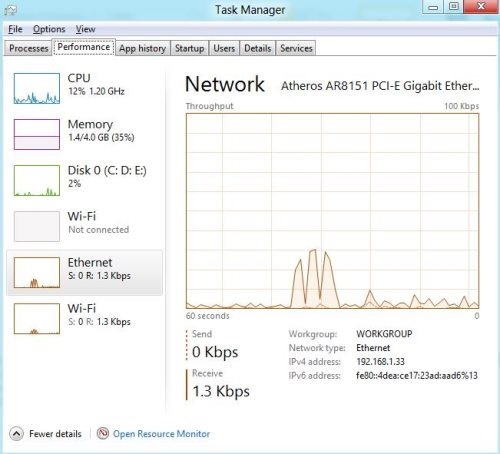 Windows 8 task manager involves two complementary columns as well, Disk and Network. Disk and network tab maintains the processes and running applications. This tab also keeps check for background processes and windows processes. Also, check out our post on how to add users in Windows 8. The performance tab shows the graphical lines, which enables detailed information of CPU, disk, Memory, and Ethernet/network/Wi-Fi usage. It also provides an extra information on selected elements like CPU, Network, Memory and Disk. For an instance, I clicked on Network, it displayed sending and receiving packets with IPv4 and IPv6 address. It also displays the network type whether its Wi-fi or Ethernet connection. 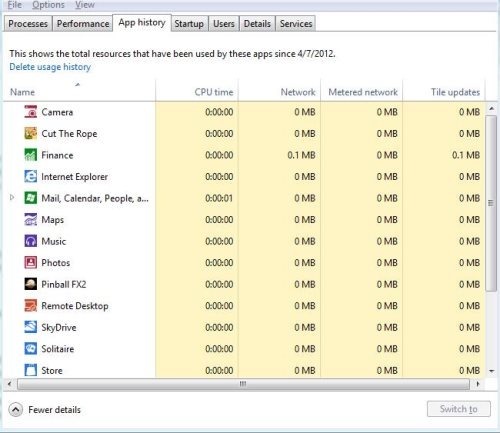 App history is a new edition In Windows 8 task manager. Shows the total resources that have been used by different apps. Enables you to delete usage history. In startup tab, you can easily manage application, which launches on startup of your PC. You can even enable and disable apps on startup of your Windows. Users tabs shows the login member with CPU, Memory, Disk and Network usage. Details tab is similar to processes tab on Windows 7. Here, you can view a collection of users and system initiated processes. You even terminate any task, by right clicking and selecting end task. You can even set the priority level. You can also check properties with detail tab. 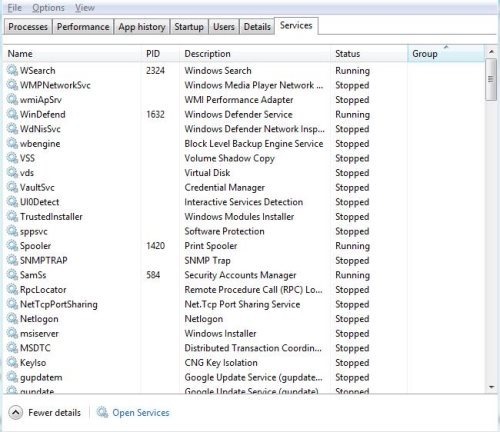 Service tabs list all passive and active Windows services. It shows the group, status, description and process id. 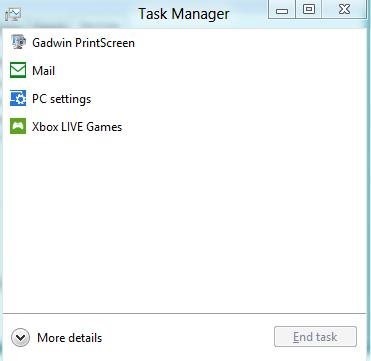 Windows 8 task manager plays a great role in extending Windows 8 to new console. Overall the specification and task are fulfilled by Windows 8, still there would be few expectations on Windows 8 still lacking between different users.